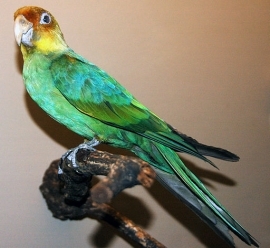 Snyder (2004) argues that the Carolina Parakeet may have lasted longer into the twentieth century than previously thought, and that this bird may have been distasteful to predators due to its frequent utilization of the cocklebur - a plant highly poisonous to many other animals. Females approximately 100g (3.5 oz); males were larger. Both adults mainly green/yellow in colour; yellow head; red/orange on lores, forehead and cheeks; yellow/orange carpal edges and thighs. Eye ring bare and white. Eye dark brown. Carolinensis smaller; ludovicianus paler in general. As in adults but with mainly green head, with less extensive orange/red on forehead and cheeks; carpal edges and thighs green. Calls were described as being loud and raucous while birds in flight; low continuous chatter while a group was feeding. The Carolina Parakeet: Glimpses of a Vanished Bird, Snyder, 2004. Not found in captivity. The last known captive bird died in Cincinnati Zoo in 1918. The main causes for the demise of this species were seen to include shooting, either by farmers or for sport, capture for the pet trade (mid- to late nineteenth century), some habitat destruction and loss of nesting sites, and disease possibly contracted from farm animals. Formerly eastern United States, including the Mississippi Valley, New York state, West Virginia to E Colorado, Tennessee, Kentucky, Louisiana and Florida. May have occurred as far north as S Ontario, Canada, or was possibly traded by indigenous tribes to and from the area. Was found in regions of well-developed valley bottom forest, especially cypress swamps in the south and sycamore stands in the north. Regular visitors to farmland and other disturbed habitats. Fed on cockleburs, sandspurs, fruits, both cultivated and wild; berries, corn, seeds, wild grapes, nuts, flowers, buds and possibly insects. Were seen in large, boisterous flocks, flying about foraging by day. Were seen to return to communal roosts in tall trees at dusk. Were acrobatic in their feeding, clambering around tree branches with great agility. Were also tolerant of cold weather. Females may have incubated eggs in groups. Seen entering and exiting nest holes from March to June.